You are Sojourner, an observer from a distant planet, sent to Earth to help determine why the people of this world have begun to display super-human capabilities. While on a routine excursion, you find yourself unexpectantly transported to the Earth’s surface. You must make it to a rendezvous point in three days to make the transport back, or you will be stranded. The only thing standing in your way is Cornelius Bartholomew, The Enforcer, who has mistaken you as an associate of Kid Sensation, a wanted member of The Resistance. Will you make it back to the pod in time or will you be stranded on this unwelcoming planet forever? The choices you make along the way will determine your fate. 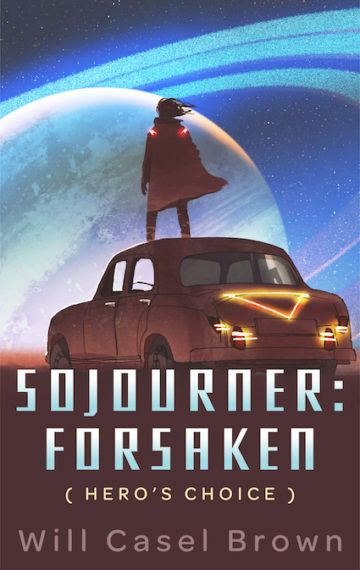 Sojourner: Forsaken is a Hero’s Choice adventure where you, the reader, make critical decisions that affect the outcome of the story and can lead the hero to victory, defeat, or even death. Choose wisely, dear reader. Your life depends on it. Read Chapter 1 “Arrival” now!